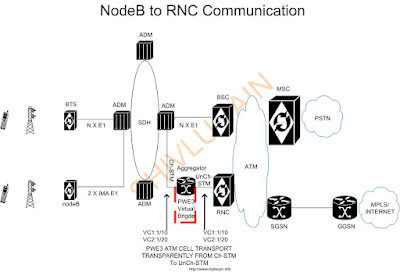 How nodeB communicates to RNC in 3G network? In the previous post, a aggregator router is added to reduce the cost and the same router is also responsible for making communication possible between the nodeB and RNC side. As in the depicted diagram, ch-STM port is used towards nodeB aggregation and un Ch-STM port is used at RNC side. The reason for using un Ch-STM port at RNC side, to overbook the bandwidth. In case of ch-STM overbooking is not possible. NodeB is allocating more than 2 E1s and to aggregate the nodeB bandwidth IMA groups are being used. The IMA group from ch-STM port is carried over PWE3 circuit towards the un Ch-STM port. By doing this we can aggregate more IMA groups towards the RNC side. This all calculation depends on the number of user and traffic.